Everyone in the room gasped as these words were shouted across the Phillips auction floor. Even Aurel Bacs, the auctioneer, was baffled. “Well, I wasn’t expecting this to happen,” he finally uttered after a silent few seconds. In fact, no one expected this, and that was only the opening bid for Paul Newman’s very own Rolex “Paul Newman” Daytona—arguably the most talked about watch among collectors, watch experts, and the specialised press. Phillips, in Association with Bacs & Russo, set the estimate for this watch at “in excess of US$1,000,000”. Some experts said it would fetch more than US$3.5 million, while others predicted up to US$10 million. They would have been right if the gavel had dropped there and then, but that was just the beginning. And with that first bid, most of the competition for Paul Newman’s watch was eliminated. For 15 minutes, three phone bidders battled for Paul Newman’s legendary timepiece. 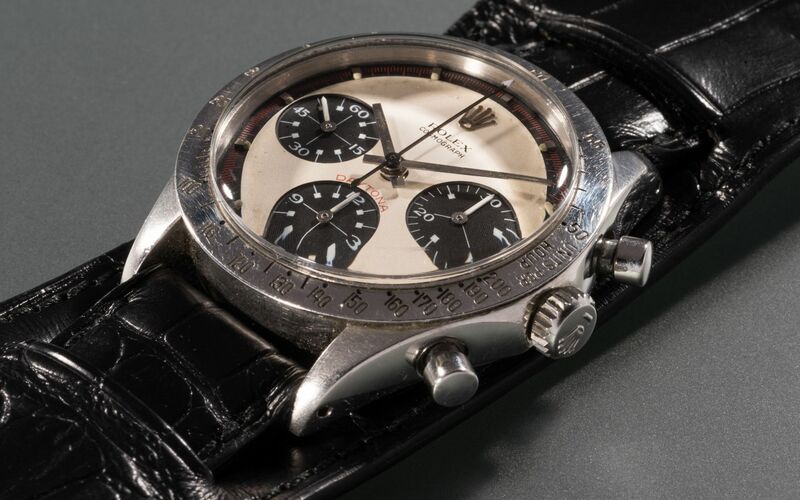 Bacs had scheduled 30 minutes for this lot—“we’re doing great on time,” he joked—but everyone was holding their breath and, US$5.5 million after the original bid, the final hammer price was up on the screen: US$15.5 million for the iconic Rolex. With a 12.5% buyer's premium, the record for the most expensive wristwatch sold at auction was raised to US$17,752,500 (around HK$138,521,416). Is it really worth that much? It's hard to say. Prices realised at auctions vary greatly depending on the condition of the watch, its rarity and provenance. And what provenance this watch has. The timepiece was gifted to Newman in the late 1960s by his wife, Oscar-winning actress Joanne Woodward, when he started his racing career. As worried as a wife can be seeing her husband racing at such high speeds, she had the back of the watch engraved with a sweet message: “Drive Carefully, Me”. The watch has remained in James' possession until its recent record-shattering sale. The “cool” factor of the watch and the hype around its sale surely helped its cause, but is it really worth more than a rare Patek Philippe? After all, Rolex “Paul Newman” Daytona watches come up at auctions quite often, especially since their value has gone up in recent years. Then again, a whole series of Rolex watches—the Rolex Daytona with “Exotic Dial”—became iconic thanks to Paul Newman. It was in the 1980s that collectors nicknamed these special dialled watches after seeing the famous actor wearing one. So you could definitely argue that having the original watch that started it all justifies the jaw-dropping price tag.